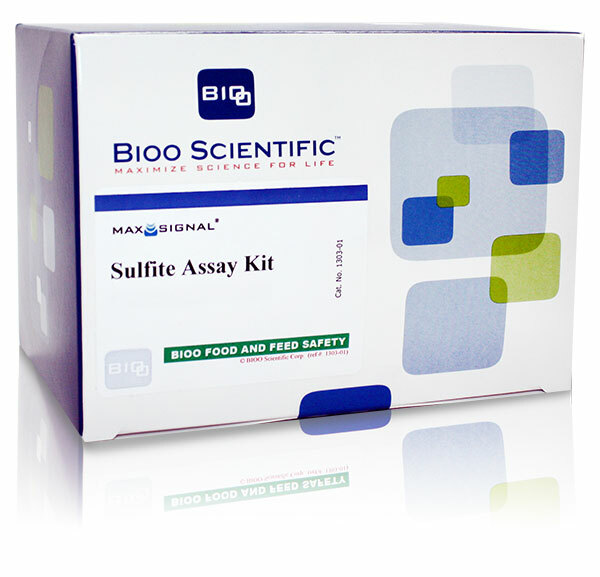 Bioo Scientific’s MaxSignal® Sulfite Assay Kit, optimized for the screening of the sulfite preservative highly prevalent in food and beverage samples, is a convenient and robust system for the detection of total sulfites in multiple sample types. This enzyme assay uses a rapid aqueous extraction, and an enzymatic reaction that requires only 20 minutes to reach completion. The MaxSignal Sulfite Assay Kit can detect as little as 0.5 ppm of sulfite in aqueous extractions, ensuring its usefulness for the majority of customers. This kit incorporates an innovative new format which offers more accurate results when testing problematic, “high-creep” samples. Tailored sample preparation methods are geared toward creating the most reliable detections in white wine, red wine, beer, juice, jam, and dried fruit sample matrices at the common regulatory limit of 10 ppm. However, the flexibility of the kit allows adjustment for custom sample volumes. The kit provides enough material to perform 50 determinations in a 1 mL cuvette, or 192 determinations in a microtiter plate (plus additional material for controls). With detection over a wide range of aqueous extract concentrations (0.5 - 1200 ppm), the MaxSignal Sulfite Assay Kit delivers highly reproducible, accurate, cost-effective and easy sulfite analysis for your most demanding needs.